Like in life in general, situations look very different to those living them than they do to simple observers… Understandably, the situation unfolding can be confusing to outsiders, especially considering that in North America Venezuela is often used as a scaremongering example of the ‘worst socialism has to offer’ by capitalist pundits, to the detriment of more nuanced examinations of the political situation. The reality, however, is that the root cause of the crisis in Venezuela is political corruption and a gradual transition towards authoritarianism, which has culminated in the current situation wherein Maduro and Guaidó are caught in a precarious deadlock which hinges on the support of the Venezuelan military and possibly foreign governments. To begin, we must first understand that the ruling party of Venezuela– the United Socialist Party of Venezuela– has been in power for years and that President Nicolas Maduro has been in power since 2013. Due in part to increasingly severe financial straits stemming from a crippling dependence on state-controlled oil revenue, the 2015 Venezuelan legislative elections ended in a massive defeat for Maduro. The opposition coalition won 162 seats to Maduro’s party’s 55. In the aftermath of the election, Maduro stated that “The bad guys won, like the bad guys always do, through lies and fraud,” and called himself a “son of Chávez” willing to protect his people. Though evidently his party had been dealt a serious blow, Maduro clung to power and retaliated 2 years later with a constituent national assembly tasked with drafting a new constitution. Maduro accomplished this by activating article 347 of the Venezuelan Constitution, which outlines the duties of this temporary parliament– namely to revise the Constitution. Nicolas Maduro has been President of Venezuela since 2013, but his tenure in office has been plagued with economic downturns, widespread dissatisfaction, and protests. The assembly was intensely controversial, to the point that its opponents called it unconstitutional and at least 100 people were killed in protests and run-ins with police. As a result of the assembly, Maduro consolidated his power. The National Assembly, however, refused to dissolve, which has resulted in some tricky diplomatic situations wherein certain governments exclusively recognize the National Assembly instead of the Constituent Assembly or Maduro’s administration, as legitimate. The situation has only gotten tenser since the 2018 Venezuelan elections, which were considered to be fraudulent for a number of reasons. Additionally, there is little faith in judicial review, as the Venezuelan Supreme Court reportedly acts as “an appendage of the executive branch” according to former Venezuelan Supreme Court Justice Christian Zerpa. 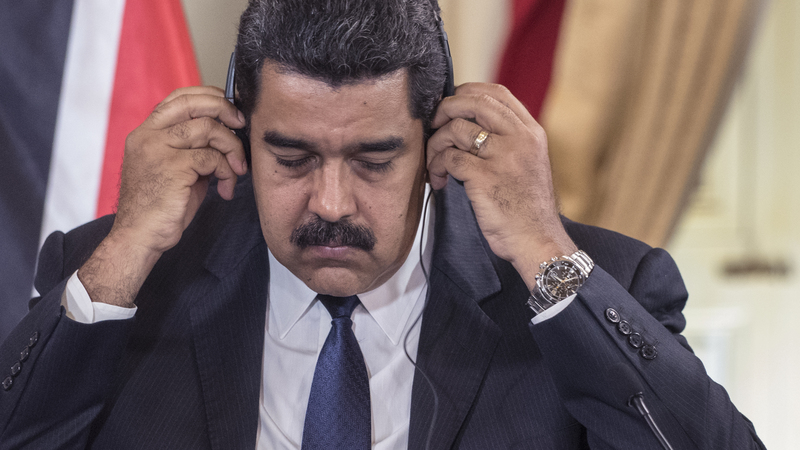 Though Zerpa supported Maduro and the Socialist Party in the past, he fled to the U.S. in early January 2019, where he has spoken out against the 2018 election by stating that it “was not free and competitive.” In the wake of the 2018 election, a number of countries severely cut back on their diplomatic ties with Venezuela and implemented sanctions. Maduro is still clinging to power, however, despite severe domestic and international pressure. This situation led to the January 21 revolt, in which a number of national guardsmen kidnapped a “captain in charge of a police station” and stole a cache of weapons in a play to oppose the Maduro regime. The plan failed when security forces arrested 25 guardsmen at an outpost and two more elsewhere, though the investigation is still ongoing. Although the soldiers were eventually suppressed, their actions obviously inspired some citizens who took to the streets and even lit a barricade on fire. In the aftermath, a number of videos featuring military figures were posted on social media. One of them featured “a man identifying himself as 3rd Sgt. Alexander Bandres Figueroa,” who used the video to ask his fellow citizens to support the mutiny; “You asked to take to the streets to defend the constitution, well here we are,” “You wanted us to light the fuse, so we did. We need your support,” he added. Maduro (left) and Guaidó (right) are currently both insisting they are the legitimate president of Venezuela. Two days after the upheaval of the 21st, opposition leader Juan Guaidó declared himself interim president of Venezuela in front of a crowd of supporters. The news was almost immediately accepted by the United States and Canada, who have long opposed Maduro; Canadian Minister of Foreign Affairs Chrystia Freeland’s stated, “Having seized power through fraudulent and anti-democratic elections held on May 20, 2018, the Maduro regime is now fully entrenched as a dictatorship.” Guaidó, however, remained relatively unknown on the world stage until his explosive rise to prominence on the 23rd. Though the 35-year-old has been heavily involved in politics since his participation in student protests against Chavez years ago, his prominence has been largely domestic. While it is practically certain that Maduro manipulated the May 2018 election using decidedly undemocratic means, Guaidó (who has no official mandate from the people) declaring himself president also raises some red flags. The crisis in Venezuela raises one of the most basic questions of Western political philosophy… Is it ok to break the law if the law is unjust? In other words– is this a coup? Or was the real coup what Maduro did first in order to stay in power, making Guaidó the people’s liberator and legitimate ruler? This remains a contentious question. The government of the United States has been vocal about the situation in Venezuela, and released a video of Vice President Mike Pence calling Maduro a dictator. The question becomes more complicated, however, when one considers the danger of US intervention. Foreign interference could realistically help legitimize either side, but depending on foreign input is risky. While, some intervention by the international community can be good (for example, observers during an election) other types can be bad, as demonstrated by the long and sordid history of the US interfering in other countries to obtain oil/resources/or a geopolitical advantage. The outcome is rarely positive for the country in question. At present, at least 20 countries, including Canada and the US, now recognize Guaidó as the interim president of Venezuela, while a number of other countries, including Russia, China, and Cuba, publicly support Maduro. As it stands, Guaidó has civilian and international support, but he does not control the military or the state coffers, which, it could be argued, makes his claim to power largely symbolic. Yes, in a perfect world the right to rule would come exclusively from the consent of the governed, but practically speaking it is hard to govern when you don’t have an army and your opposition does. Though some air force officials have pledged their support to Guaidó, there is no overt sign at this time that the rest of the military is going to defect from Maduro’s regime. In an effort to put pressure on both the military and his rival, Guaidó has “opened a corridor for humanitarian aid “ from Columbia, which Maduro is against, thereby forcing military personnel to choose between denying their fellow citizens aid and disobeying Maduro’s command. Medical supplies from Columbia are one thing, but Guaidó risks opening the door to significant foreign interference if he accepts military aid under the guise of international support. After all, it would not be the first time that the United States sent armed forces to South America, and President Trump has been extremely vocal about the fact that American military intervention in Venezuela is “an option.” In addition to the possibility of military action, the US has also put new sanctions into effect, which specifically target Venezuelan oil revenue and attempt to divert funds that would ordinarily go to Maduro towards Guaidó. It is crucial, however, to remember that not all foreign actors support Guaidó. Russia has supported the Maduro regime for years both politically and economically, having loaned billions of dollars to the Venezuelan government. The fact that both Russia and the United States have vested interests in Venezuela undoubtedly complicates this crisis further, as it increases the likelihood of a proxy conflict wherein both actors aim to protect their sociopolitical or economic investments. It is undeniable that any sort of continuation of the current standoff between Maduro and Guaidó will put people at risk. Already, Venezuelan citizens have had to endure incredibly difficult circumstances over the past years, including poverty and food shortages. Factions backing Guaidó have asked for civilian support, and, as mentioned earlier, previous political protests in Venezuela have ended in injury and death. Though it is more than understandable for people to take an interest in their own political situation, not everyone feels that way. People have been fleeing Venezuela since the beginning of the economic crisis, but this kind of upheaval could realistically cause an uptick in the number of citizens who choose to leave, despite the dangers and difficulties that come with being migrants or refugees. In conclusion, the situation in Venezuela is murky, to say the least. While Maduro is by absolutely no means a shining example of good governance, and it is incredibly tempting to believe the narrative that Guaidó really is the young, inspiring liberator of his people meant to fight authoritarianism with truth and right. The fact remains that Guaidó’s best quality is that he is not Nicolas Maduro. Though he recently unveiled Plan País— his strategy for rehabilitating the Venezuelan economy– how he expects to implement it remains unclear. Without the support of the military or control of the state coffers, Guaidó’s reach is limited. If he leans too heavily on foreign aid, he risks letting a foreign power wreak havoc on his country, and if he cannot sway the military to his side Maduro is not likely to capitulate. Juliana Riverin is a U2 student currently pursuing a degree in Political Science and a minor in Canadian Studies. She specializes in culture pieces that relate to the subjects of race and gender, as well as Canadian international affairs. When not writing for MIR she acts as a web editor for Chrysalis.